Belkasoft will be present at the “Forensic meeting” in Roma and Milan on Sep, 11-12. Nikita will have a speech on latest Belkasoft developments in the area of computer forensic analysis. See more details on the event at http://www.4n6.it/en/news.php. Looking forward to meet our Italian customers! 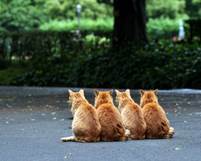 How many kittens are sitting on the street? If you thought “four”, read along to find out! Great news! We’re proud to announce yet another step leading to a tighter partnership with Guidance Software. Our entire product line is now officially integrated with Guidance EnCase, and appears in EnCase App Central. We view the tight integration with Guidance EnCase and the acceptance in EnCase App Central as a quality seal for our products. Our forensic tools enjoy continuous success among EnCase users. We’re looking forward for more EnCase customers to use our software. We have also introduced two new editions of Belkasoft Evidence Center. The new entry-level edition is called Belkasoft Chat Analyzer. The other edition is called Belkasoft Chat & Social Analyzer. Belkasoft Chat Analyzer will cost EnCase users some $199, while Chat and Social Analyzer is $499. Belkasoft Chat Analyzer is identical, feature wise, to Belkasoft’s entry-level edition called Forensic IM Analyzer (regularly priced at $499.95), while Chat and Social Analyzer integrates the ability to carve hard drives, drive images and memory dumps (via Live RAM analysis) for remnants of chats and communications carried over a variety of applications such as instant messengers and social media (Facebook, Twitter etc.) At $499, Chat and Social Analyzer offers EnCase users more features than similarly priced Belkasoft’s entry-level edition. The rest of the lineup (Professional and Forensic Studio Ultimate) is also published at EnCase App Central and is unchanged. We finally released this long-awaited update. We spent a lot of time developing, testing and improving this release. Well, it’s here now! Version 5.4 offers a host of new features, functionality and usability improvements, easily becoming the best Evidence Center so far. We’ve added faked image detection, recovery of destroyed SQLite evidence, Timeline view and much more! Windows Registry support automatically locates and parses registry hives, extracting many types of valuable evidence.